Author: Malin Petzell. Series edited by: Bernd Heine, Wilhelm J.G. Möhlig. Kagulu is a Bantu language, classified as G.12 following the Bantu language tradition. It is spoken in the Morogoro region of Tanzania, inland from Dar es Salaam, by approximately 240,000 people (2006). Kagulu was fairly undescribed before this work, and there is little information about the language. The most extensive source of Kagulu so far is not linguistic, but anthropological. All the Kagulu data was collected by the author in the area in which Kagulu is spoken in Tanzania. This was done chiefly by the method of linguistic elicitation, including distributing questionnaires and carrying out interviews. Spontaneous speech was also recorded for grammatical analysis. The relation between the Kagulu language and its sociocultural context, i.e. the sociolinguistics, is sketched in the introduction. The data stems from a sociolinguistic survey carried out in Kagulu schools. The survey answered questions on what position Kagulu holds in society, current tendencies of language competence and use, and general attitudes towards minority languages in Tanzania. The grammatical description that follows focuses on morphology. However, a prerequisite for describing the morphology of a previously undocumented language is to analyse the sounds and decide how to depict them (i.e. orthography). For that reason, this work begins with a brief phonological sketch including a sound inventory. The morphology of the noun and verb constitutes the bulk of this book. The noun phrase and its constituents are described in depth, alongside the verb phrase with its complex agglutinating morphology. The syntax chapter examines some basic questions about Kagulu word order and different types of clauses. The theoretical framework used in this work is that of Basic Linguistic Theory. This theory aims at describing each language on its own terms, focusing on the language facts, and it avoids using theory-specific terminology. It is basically the cumulative tradition of linguistic theory up to the present day. Lastly, some Kagulu texts can be found. The texts were recorded in the Kagulu area and later transcribed, segmented and glossed. They represent everyday speech exhibiting most of the issues dealt with in this work. Petzell’s book undoubtfully offers an excellent description of Kagulu which will hopefully advance further research on this language to the advantage of Bantu linguistic studies and for the benefit of the Kagulu people and their culture. Further study of Bantu languages in the area might include the question to what extent some of the features of Kagulu grammar are the result of contemporary contact, or are found in the wider central and eastern Tanzania Bantu area, or indeed reflect particular univerals of human language. The present volume provides a good foundation for addressing questions like these in the future. 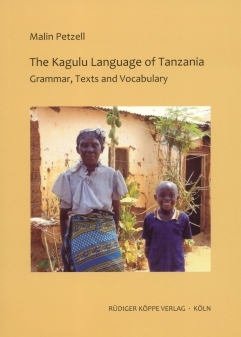 There is almost no descriptive linguistic work available on Kagulu, a language of eastern Tanzania (also referred to as Kaguru or Chikagulu). A grammar by Last (1886) is generally unreliable, and only very brief descriptions or mention of the language are provided by Kadima (1969), Kamba Muzenga (1981), and Tucker and Bryan (1957). Thus, this basic grammar is an important contribution not only to our knowledge of this language, but to the ever-growing list of descriptions of Bantu languages. It is a revised and expanded version of the author's doctoral dissertation (University of Göteborg, Sweden). The description is straightforward and clearly written. In conclusion, I want to compliment the author on this widely accessible grammar of an hitherto underdescribed Tanzanian Bantu language.The Kagulu data are often put in a broader perspective and the author shows she knows the relevant literature (and the relevant people, as references to personal communications are abundant throughout the grammar). I do think that some language facts, especially regarding to verbal morphology, need more thorough investigation and that at times more data are needed to better understand and analyse certain language facts. Nevertheless, I would like to stress that I really enjoyed reading this grammar from A to Z. It inspired me to do some puzzling of my own and this would not have been possible were it not for its clear writing, the fully glossed examples and texts, and the wordlist. In the end, inspiring people to do descriptive linguistics might be more important than presenting them with a watertight analysis, although one of course not necessarily excludes the other.